Peltor Next Tri-Flange reusable silicone ear plugs provide great comfort and protection. Soft, pliable, translucent triple-flanges form a triple-seal against noise, offering an NRR of 26dB. These plugs have a cool, High Octane look and style, and they're easy to insert and clean. 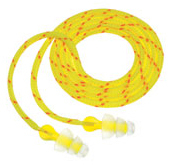 TriFlange features a LiveWire cord, making it easy to keep track of these long-lasting ear plugs. The Tri-Flange design conforms gently to the shape of your ear canal for a comfortable fit even when you must wear your earplugs for extended periods. Peltor Next Tri-Flange Reusable Ear Plugs Corded (NRR 26)3DragoDecember 10, 2018The plugs have supple enough flanges but the Stiff Core would aggravate my ear canal. Couldn't wear them for longer than 10 minutes. Peltor Next Tri-Flange Reusable Ear Plugs Corded (NRR 26)5NoelSeptember 11, 2016These are the best ear plug of this style I have ever used. The hard plastic grip helps seat the ear plug and makes it more efficient. Peltor Next Tri-Flange Reusable Ear Plugs Corded (NRR 26)5DebraSeptember 4, 2012Yes! These are the ones I've been seaching for. They are perfect for my disability of very sensitive ears; they are perfect both in volume control and daily use of long hours in comfort. Thank you! Sounds crazy but I'm going to buy a box of them; never, ever want to run out again. Peltor Next Tri-Flange Reusable Ear Plugs Corded (NRR 26)5PeterAugust 17, 2012I can find these love the color. I wear these while riding my motorcycle. Makes the ride much better and I can still hear whet I need to. Equal comfort to my hearing aids. Yes I remove the aids while using he tri flanges. Peltor Next Tri-Flange Reusable Ear Plugs Corded (NRR 26)5FloraMay 20, 2012These earplugs are the best I have ever used. Plus they are very comfortable. Peltor Next Tri-Flange Reusable Ear Plugs Corded (NRR 26)5truffles111December 31, 2011I have trouble concentrating in a noisy environment. These are the best ear plugs I have ever used to block the sound. This is my second order of a dozen pair. Peltor Next Tri-Flange Reusable Ear Plugs Corded (NRR 26)5JPeteSeptember 30, 2011I work in a machine shop and use these every day. I especially like the silicone flanges as I can wear these for hours unlike the foam earplugs which I find irritating. I have also used these at the gun range and they block even the loudest shots. I highly recommend. Peltor Next Tri-Flange Reusable Ear Plugs Corded (NRR 26)5Yvonne Simper SimperAugust 25, 2011I like the earplugs. I am very noise sensitive. I live with hard of hearing people and this has helped with tv volume. Peltor Next Tri-Flange Reusable Ear Plugs Corded (NRR 26)5Tiffany MillerMay 9, 2011Had previously purchased this product at a gun shop, but they were discontinued. Had been trying to find them again & was thrilled to find this on-line store. Could not be happier with this product. They are fabulous & completely close up the ear canal meaning NO NOISE! Keeps all noise out during the night and are great for those crying babies on planes, also. Peltor Next Tri-Flange Reusable Ear Plugs Corded (NRR 26)5G teoliMarch 14, 2011Clean and comfortable. I use the cord to tie to my safety glasses. I never lose them. Cuts off any overly harsh noise in my work environment. Not too expensive. Peltor Next Tri-Flange Reusable Ear Plugs Corded (NRR 26)5CarolJanuary 22, 2011These are some of the few I've found that fit, without messing up the sound of the music too much--they lower the volume nicely. Peltor Next Tri-Flange Reusable Ear Plugs Corded (NRR 26)5cj heckJanuary 12, 2011i have used these ear plugs for 2 years and find them to be the most comfortable i have ever used. that is the reason i reordered them, and unless they stop making them, i will continue to do so. Peltor Next Tri-Flange Reusable Ear Plugs Corded (NRR 26)5DainiusNovember 7, 2010This product is perfect when you do carpentry solutions.